The purpose of determining the state vector was to see if their course to the Moon was true and, if not, to do something about it. With this in mind, seven occasions were set aside in the flight plan for possible trajectory corrections; four on the way out and three for the return trip. Having determined the state vector and calculated the current trajectory, FIDO -the controller primarily concerned with planning the spacecraft's trajectory - then brought the RTCC computers to bear on the task of working out the magnitude and direction of a mid-course correction, the manoeuvre that would restore their current path to the ideal. If the mid-course correction was small, as it usually was, it could be made with the RCS thrusters on the side of the service module; otherwise the SPS engine was called upon to make larger changes to the trajectory. 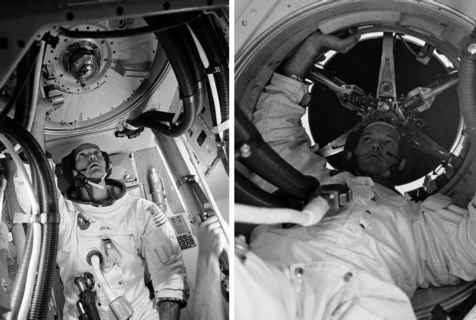 On some occasions, the flight controllers deliberately started the crew on a trajectory that was slightly away from ideal in order to allow them to correct it using the SPS, thereby providing an opportunity to exercise the big engine and see how well it worked. Everyone knew how crucial this engine was and even a short burn lasting a second or two - little more than a burp - generated reams of engineering data. Having worked out the details of any required burn and checked them carefully, FIDO passed all the information on a standard form where about six copies would be made using no-carbon-required paper. Capcom read the top copy up to the spacecraft as pre-advisory data (PAD) - a list of numbers abbreviated down to barely the digits with units and decimal points omitted. Accuracy and interpretation was much easier when the PAD was laid out on a standard form. On board, the list was copied, usually by the LMP, onto an identical form and read back to Earth as a check of their accuracy. As the time for the burn approached, the data from the PAD was entered into the first of a series of programs on the computer that automatically controlled the burn. The PAD included three items that were crucial for the burn: when it should occur; the amount by which it should change the spacecraft's velocity; and the direction in which the spacecraft should be pointing at the time of the burn. The PAD also included supplementary data: some was for the computer and its control routines; some was to improve the safety of the burn by offering details of backup methods of shutting down the engine; and some was to ensure that the attitude of the spacecraft was correct. When flying in space, and especially when firing engines, knowing the direction in which a spacecraft is pointing is of paramount importance, and three methods of checking this were included in a typical PAD. A crewman could look through the sextant, having previously aimed it to a given angle, where he would expect to see a specific star centred in the eyepiece. A second check came from sighting another star with the COAS, having first mounted this sight in a window to look in a known direction. Their primary method of attitude determination relied on one of the major systems on board the spacecraft; the guidance and navigation (G&N) system with its inertial measurement unit (IMU) - a gyroscopically stabilised platform built into the spacecraft's lower equipment bay below the optical systems. With the spacecraft aimed correctly and the PAD data entered into the computer, the burn could be controlled automatically or manually, as desired, with its results displayed for the crew to monitor. The guidance and navigation system on board the Apollo command module was not only used for cislunar navigation exercises. It also formed an entire control system in itself that, to list just a few of its abilities, could be used to manoeuvre the spacecraft, control its attitude and make calculations relevant to many operations that might be carried out in orbit or during cislunar coast. It could fire the SPS engine, calculate the size and shape of orbits, aim cameras and other instruments at any target or maintain a desired attitude. The design of the G&N was one of the first contracts awarded by NASA after President Kennedy set his lunar challenge. It was given to MIT, which had gained much experience in this field by designing inertial navigation systems for the US military for use in submarines, aircraft and the Polaris missile system. The design was based around three tightly integrated systems that worked together to provide a large range of functions.